Are Advanced Laparoscopic Surgeons Ready to Embrace ‘Touchy Feely’ Feedback? Ensuring the maximum educational output is achieved by trainees from each training session is a priority for every trainer. Given that laparoscopic surgery is known to be technically challenging and difficult to learn, any potential improvement to training of it should be explored. The aim of this study was to determine whether feedback should be a routine part of training advanced laparoscopic surgery. Forty-three semi-structured interviews were carried out by two interviewers (29 surgical trainers, 10 senior surgical trainees, and 4 educationalists). Interviews were transcribed and analysed by two raters using N-VIVO software. Item lists were created, and using the Delphi method, item importance was ranked by 11 national training program laparoscopic trainers and 5 senior surgical trainees who all had laparoscopic experience, using a 7-point Likert scale (1=very unimportant, 4=undecided, 7=very important). Items scoring <4 were removed. The reliability was evaluated by internal consistency (Cronbach’s alpha) and inter-rater agreement. Mann Whitney-U test was used to determine any specific difference of opinion. Consensus was reached through two rounds of the Delphi process. Twenty-seven items regarding feedback were extracted from the interviews, seven were removed. Reliability tests showed good consistency within the trainers (alpha=0.86), but less so for the trainees (alpha=0.55). There was good overall inter-rater agreement (0.785). Those items ranked the most important by both trainees and trainers were to: (1.) Discuss issues from the last case before starting the next case (2.) Provide positive reinforcement during the case, (3.) After the case; discuss the trainee’s technical performance, (4.) devise learning points for the next case, and (5.) actively encourage the trainee to reflect independently on their performance. More detailed analysis demonstrated that after a case had concluded, trainees thought as part of the feedback session it was more important for a trainee to discuss their feelings during the case (mean score 6.6 vs. 4.1 p=0.003), and any links such emotions might have had on the resultant performance than trainers (mean score 6.4 vs. 4.1 p=0.029). The importance of ongoing feedback throughout a training session in advanced laparoscopic surgery has been determined through joint expert and trainee consensus opinion. 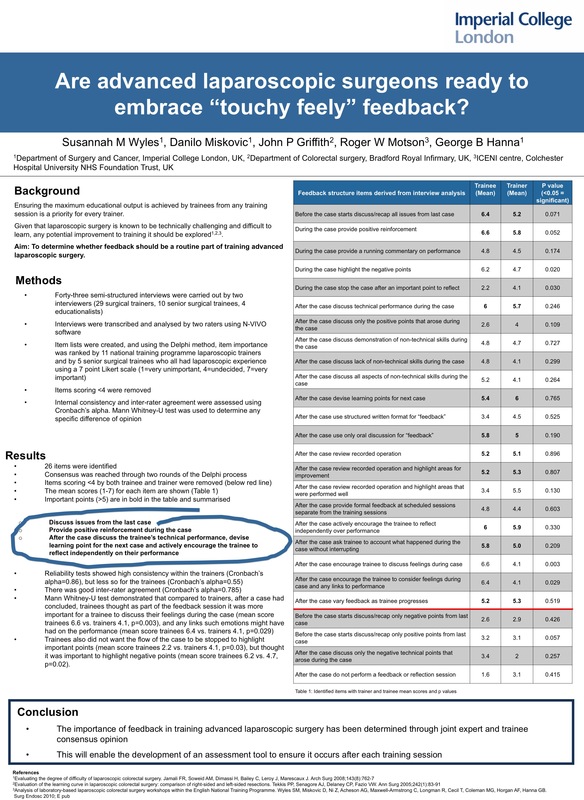 This will enable the development of an assessment tool to ensure the “stigma” of the “touchy feely” feedback is removed and that instead it simply becomes an accepted routine part of training sessions.